The first H1N1 flu pandemic, dubbed the 'Spanish 'flu', claimed over 50 million lives from March 1918 to June 1920, which was around three per cent of the world's population at the time. It was a mortality rate higher than that of the First World War, which was ongoing at the time the flu was first noticed in Spain. In April 2009, almost 89 years later, an evolved version of the H1N1 virus struck again, leading to the world's most recent flu pandemic. A pandemic is generally defined as a disease epidemic that has spread on a global scale, with at least three influenza pandemics each century for the last 300 years, the others in the 21st century happening in 1957 (Asia; H2N2 subtype) and 1968 (Hong Kong; H3N2 subtype). These influenza pandemics are caused by a new strain of the virus, which is transmitted from animals to humans whose immune systems are not able to cope with the new virus strain. This can lead to rapid spread of disease in a large population group, with the World Health Organisation (WHO) publishing a six-stage classification guide to officially judge when the spread of a virus reaches pandemic levels. 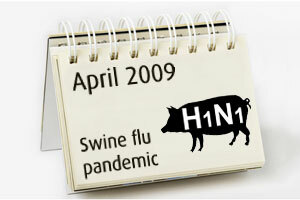 For the most recent strain of H1N1, this was in June 2009, with evidence that it had reached the southern hemisphere. The virus first became known in Mexico, however, in the state of Verecruz, getting its 'swine flu' nickname once it was discovered that this new strain was made from a combination of an existing H1N1 strain with a Eurasian pig flu virus. It killed more than 18,000 people, according to the WHO, although it is likely that the true figure was higher. These levels are far from the devastating consequences of Spanish flu, however, with the 2009 virus not only being a less secere form of H1N1, but also occurring in a very different era for health. Instead of striking a war-torn Europe, with close troop quarters and large-scale movements of army divisions bringing the virus to the rest of the continent, the 90 years between the two pandemics had seen the introduction of the WHO, public health programmes, improved healthcare systems and huge advances in vaccine production and development. The prevention effort started almost immediately after the first Mexican cases were known, with the European Union health commissioner advising Europeans not to travel to the US or Mexico, although the quarantine of the first confirmed European cases in the UK and Spain happened on April 27, 2009. Furthermore, despite existing flu vaccines (GlaxoSmithKline's [GSK)] Relenza and Roche's Tamiflu) demonstrating some effectiveness against the new virus, the race for a specific swine flu vaccine began. Using a seed virus provided by the US Centers for Disease Control and Prevention (CDC), vaccine companies CSL and Vaxine planned to initiate the first clinical trials for a swine flu vaccine in Australia in July 2009. However, they were beaten by Novartis, which became the first company to test a vaccine in humans. GSK and Sanofi Pasteur followed with their own investigations, using chicken eggs to grow the virus for use in their vaccines. It was not long before the first products became available for use in the public, with the European Medicines Agency (EMA) approving both GSK's Pandemrix and Novartis' Focetria in September, 2009. By November 2009, when levels of swine flu cases had begun to drop, hundreds of millions of doses of vaccine had been administered around the globe, with some pharma companies donating stock to developing nations free of charge. Vaccines sales still climbed for Roche, GSK, Sanofi and Baxter, with richer nations preparing for pandemic by stocking up on millions of surplus stocks. Such reaction has led some critics to suggest that the WHO overstated the virus' threat, with the organisation initially warning that about 30 per cent of the world's population (about two billion people) could contract the virus. This included accusations of conflicts of interest, with some flu experts advising the WHO on its course of action said to have links to pharmaceutical companies, which would benefit from vaccine sales. Critics included Fiona Godlee, editor of the British Medical Journal, who wrote in that publication: 'WHO's guidance on the use of antivirals in a pandemic was authored by an influenza expert who at the same time was receiving payments from Roche, the manufacturer of oseltamivir (Tamiflu), for consultancy work and lecturing'. In her open letter response, Dr Margaret Chan, director general of the WHO, refuted Godlee's claims of commercial interest in the WHO's decision making, stating: 'decisions to raise the level of pandemic alert were based on clearly defined virological and epidemiological criteria. It is hard to bend these criteria, no matter what the motive'. The European Commission has since proposed centralised procurement for vaccines when the continent is faced with any future major public health threat, ensuring no one country has surplus vaccine while others do without, as well as joint purchasing efforts to negotiate the lowest price possible. The 2009 pandemic may not have been the disaster some predicted, but it has provided valuable lessons for the future.